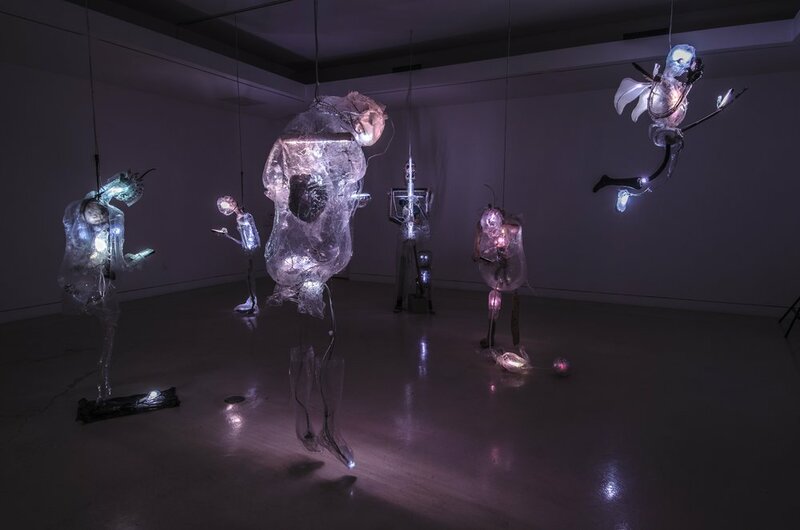 Danial Nord’s solo project, Cloud Nine, is a media-driven installation of life-sized, translucent humanoid figures, suspended in the dark, activated by their flickering smartphones. These radiant data-fueled zombies are networked together while clearly detached from one another - a portrait of 21st-century social disintegration. Each sculpture embodies a distinct news-based persona: Businessman, Gunman, Mother, Alien, Illegal - transfixed by the mobile device that controls their internal illumination. To create this installation, Nord has developed new artistic processes that are entirely his own. He has invented a system that transforms video from social and mass media into malleable illumination for sculpture, via computer-driven LEDs, reprocessing public material and current events to confront the status quo. For Cloud Nine, video is algorithmically selected for each character and converted into light-signals that pulsate through the figures’ innards. Thus, the body and technology become inseparable. To sculpt the external forms, Nord has innovated a method of fire-casting clear polycarbonate sheets onto hand-built sand molds, like coarse vacuforms, to create translucent body parts that uniquely transmit light. He uses sand as a basic, free, earthly material, but notes that silica (purified to silicon) is also the foundation of his computer-driven technologies. This dialogue between high and low-tech elements and techniques resonates throughout the installation: coastal flotsam and jetsam and sticks and stones are integrated in surprising ways with sophisticated plastics and advanced electronics. Cloud Nine is a culmination of the artist’s complex experimental processes. Working on his hands and knees in the sand during the past year, Nord physically connected with South Bay beaches to create and torch the large-scale molds that are central to his installation. He engaged the Port of LA, City of LA Fire Department, Lifeguard Department, Parks and Recreation, and other entities to permit his unusual public process. He also solicited in-kind donations of installation components and materials from locally based manufacturers. The tangle of communications, agencies, companies, and community members is part of the artist’s overall practice and becomes his outside-the-box support system. Cloud Nine is Nord’s first solo museum exhibition. His recent projects include commissioned installations for the Beall Center for Art and Technology at UC Irvine and the UC Santa Barbara Public Arts Research Lab. His large-scale media-driven sculptures were featured in "State of the Art: Discovering American Art Now" at the Crystal Bridges Museum of American Art, and in the 2013 California-Pacific Triennial at the Orange County Museum of Art. Nord’s work has been exhibited in the US and abroad, and he has been honored with numerous awards including two Artistic Innovation Grants from the Center for Cultural Innovation and a City of LA Individual Artist Fellowship. He lives and works in San Pedro, the port of Los Angeles.